Most parents will start training their child to use the potty around 18-24 months, but there’s certainly no rule that says you have to starting training around that time. You might need to train your little one before 18 months or wait until after the 2 year mark, but either way, know the signs of when your child is ready and be patient! Modeling is one of the most effective ways to teach a child a new skill. But since we aren’t exactly about to model to our toddlers how to use the potty ourselves(hopefully! ), another great “model” we have is a potty-themed book. 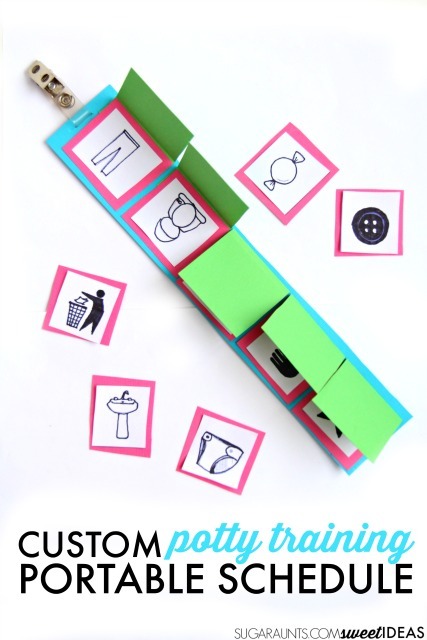 No Time For Flashcards has a great list of potty training books that can be found here. In addition to using books to teach your child about potty training, download some apps for some additional support. Games are always a great enrichment activity for helping new concepts become habits! Before you start training, stick a sign on the wall under the toilet paper roll to show your child how much toilet paper to tear off. By giving your toddler a cut off point, you’ll save yourself the mess of a clogged toilet once the training really begins. Stuff Parents Need suggests that having your toddler learn to potty train with a stuffed friend can be quite helpful. Show your child how his/her stuffed friends use the potty and they can all become big kids together. We all like to see our progress when doing something challenging. Help motivate your child to use the toilet by posting a sticker chart somewhere that he/she can see often. I mean, really, who doesn’t want to put a sticker on the poo chart? Since potty charts are usually stuck to a particular wall or location in the home, how can you help your traveling potty training toddler as you go out and around exploring the world around them? Sunny Day Family suggests this cute passport trick. The idea is that the passport can travel with you and serve as a reward system as you are away from the home. Say Bon Voyage to accidents when you’re on the go! Keep one step ahead of the accidents. Give your child a timer or watch that will help remind him/her to use the potty every 30 minutes. Even if they don’t have to go, still have them at least sit on the potty for a few minutes to start recognizing when they do/don’t need to go. Some “helpful” potty training tips can backfire before you can even say “flush”. Some examples include having your child face backward on the toilet and letting them use a dry erase marker to doodle on the toilet lid. Another example is putting Cheerios in the toilet bowl to give your little guy something to aim at in the bowl. However, I’ve found that these ideas encourage children to carry these behaviors outside the bathroom as well. Train them enough that coloring on the toilet lid is okay and pretty soon you’ll have marker on the wall. Or, train them that aiming for Cheerios in the toilet is fun, and your little guy will be aiming for other things around the house as well. Although there are many potty training ideas that can backfire, I think this “magic water” idea is less of a risk. Simply drop some food coloring in your bowl just before your child goes potty and let them get excited by how the water magically changes color when they use the potty like a big kid. Here’s an incentive idea from Life Kids and the Pursuit of Sanity. Fill a box with empty toilet paper rolls and then place rewards inside each tube. Cover the tubes with tissue paper and each time your child successfully uses the potty, let him/her punch out one of the tubes. I don’t often believe in candy as an incentive, but a small sucker for a week or two during potty training isn’t going to hurt anyone. Some children might struggle with potty training at night because it’s dark. For these situations, you can try a motion activated toilet light to help make the dark exciting rather than scary. Teach your toddler some potty training songs to help them memorize all the steps to going potty right up to washing their hands. Here are some videos/songs to get you started. Automatic flushing toilets might be scary to some potty training toddlers. Take some Post-It Notes with you when you’re out running errands and cover the sensors that make a toilet flush automatically. Potty training for kids with learning disabilities and/or attention problems can be even more stressful than normal! For these little guys, help them remember the steps to going potty with a portable visual schedule. Happy Hooligans has some great suggestions for when a child won’t poop in the toilet. One tip is to have your toddler help clean his/her messy underpants when they leave a poopy mess. No one wants to clean up that mess! Reduce the chances of missing the bowl by providing your child with a step stool for easier access. We all know that no two people are alike. We all have different learning strategies that work and don’t work for our unique personality. Here are some suggested potty training modifications from Therapy Fun Zone to try with a toddler if nothing else seems to be working. ← How to Organize Your Tiny Bathroom- With Messy Kids!